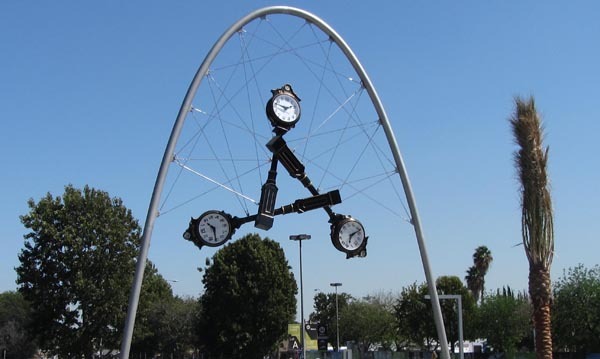 Time Piece, a sculpture designed by Donald Lipski for the new El Monte Station, which includes three double sided clocks, and is suspended by a network of cables from a 30 foot tall stainless steel arch. An iconic, large-scale sculpture by Donald Lipski is installed at Metro’s new El Monte Station, which is opening Oct. 14! Click here for a Source post documenting the installation of this artwork, and here for more information on Donald Lipski’s work. An iconic sculpture by Donald Lipski will welcome transit riders at the new El Monte Station, set to open to the public on October 14. A project of Metro’s art program, the artwork provides an aesthetic and contextual landmark at the newly expanded bus hub. Lipski, whose monumental works of art inhabit public environments throughout the United States, created a clock tower–with a twist. Entitled Time Piece, the artwork incorporates three traditional clocks within a highly contemporary framework. The functional, double-sided clocks are minimally suspended from a sweeping, 30-foot tall stainless steel arch using a web of thin stainless steel cables. The clocks are internally illuminated and in total provide six clock faces. Each clock weighs a hefty 350 lbs. Lipski’s take on a modern-day clock tower was inspired by visits toEl Monte, and by imagining the hustle and bustle at the new transit hub. For centuries, clock towers have been prized civic monuments and meeting places, particularly at transit hubs. Time Piece pays homage to this tradition but is updated to contemporary times and the specific context of the bold, modern architecture of the new facility. One side of the clock faces, as customers enter the bus terminal, is modern and says “Metro.” The opposite clock faces, as customers leave the station says “El Monte” and incorporates the city seal. All six clock faces display the same exact time. Donald Lipski is an internationally renowned sculptor with works represented in the Metropolitan Museum of Art (New York), theWalkerArtCenter(Minneapolis), and the Chicago Institute of Art and has received the coveted Rome Prize from theAmericanAcademy inRome. The clocks were manufactured by The Verdin Company in Cincinnati, Ohio. A maker of clocks and bells, which has been operated by six generations of the Verdin family since 1842. Assembly for all the sculptural components, the arch and the clocks was completed by JunoWorks, a specialty metal fabricator with a history of uniquely creative projects. Artwork installation at the station plaza was provided by KPRS Construction Services, Inc. with oversight from the artist, JunoWorks and Metro Art staff. Built in the 1970s, the original transit center was the busiest bus-only station west of theMississippi. The station was demolished to make way for a new two-level station, doubling its previous size and will accommodate up to 40,000 daily riders. The new station has modern amenities including variable message signs, intercoms, closed circuit television, solar panels, wayfinding equipment and information displays, new elevators and escalators, a transit store, bike stations and lockers. From rail and bus stations to transit facilities, construction fences and poetry cards, Metro Art enriches the transit environment and contributes to the artistic vibrancy of the neighborhoods we serve. Metro commissions artists to create engaging artworks that make the journey more inviting and pleasurable for transit users. The artworks mirrorLos AngelesCounty’s rich contemporary and popular cultures. To request images of artwork for publication please email zellerh@metro.net.